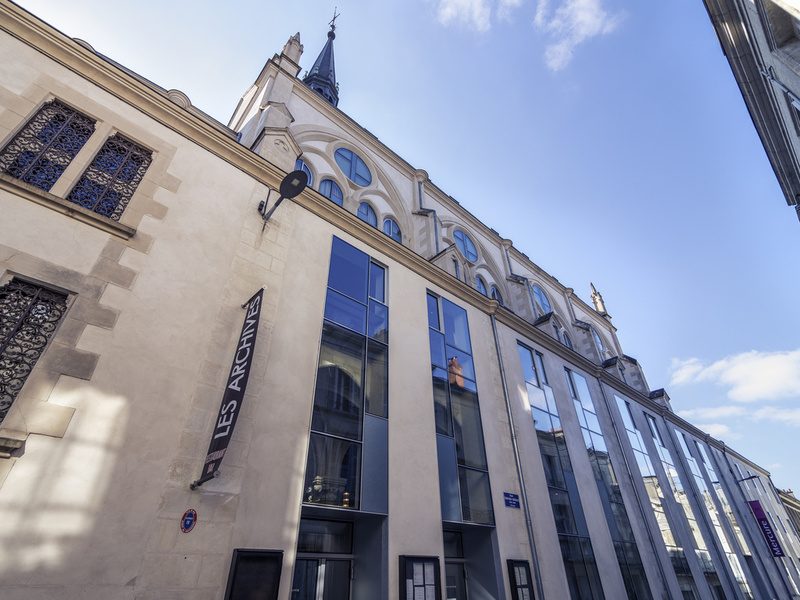 Within easy reach of Poitier's mainline railway station, and in the heart of this main city of Poitou-Charentes, the four star Hotel Mercure Poitiers Centre offers exceptional, well-equipped rooms in a former Jesuit chapel, built in 1854. For a really wonderful experience, book one of the rooms in the Nave, with a fantastic view over the city of Poitiers. After a day of business meetings or sightseeing, relax in our cosy bar or restaurant. The convenient location of theis Mercure Hotel allows you time, during your business trip or family holiday, to explore Futuroscope as well as places such as Fontevraud Abbey or the village of Montsoreau, with its castle and troglodytes (caves). Brasserie-style independent restaurant located within the Chapel and accessible from the hotel reception. Independent bar located within the Chapel and accessible from the hotel reception. Room 318 is a nice room, well equipped, comfortable and spacious. However I asked for a quiet room and room 318 is directly above the private dining room. You can hear the conversation around the dining table, often raucous, until they finish dining and the metal spiral staircase leading up from the dining room runs next to room 318 and on our last night several children took great delight in running up and down it till well past my bed time! everything from check in to departure was brilliant. All the staff were so nice and polite and helpful, neither of us speak french but almost all spoke english nothing was too much trouble. The hotel certainly has the wow!! factor from the moment you walk through the door to reception. The restaurant is excellent both with its food, service and ambiance. Overall OK but the cheap portable heater, plastic glasses and cardboard cups made the room feel low quality. Staff were fine and the breakfast was good in a great room. Could not of wanted for anything more. Had dinner in the restaurant which was amazing. The venue is stunning, would recommend to others. Will definitely stay again. The room was great with original details from the old Chapel. Everything was extremely clean. The shower was powerful and it was good having the toilet in a separate room. Les Archives restaurant had a varied menu and the food was well prepared though I did wonder why water was only provided on one of the three visits we made. Car parking was close but awkward when leaving the car park as the ticket showed up a cost 5 times higher than the agreed rate. You have to talk to the attendant and I'm not sure how good their English might be. Fortunately, my wife speaks French fluently. Overall, a very enjoyable stay. The system for wireless internet is horrible. I had to re-enter my name and other information about 5-8 times per day with my two devices. The breakfast was grossly overpriced at EUR18, and it was never made clear what was the difference between 'express breakfast' (EUR8, which I thought I was going to pay) and the more expensive option. I still don't understand how that classification is made. No one asked me in the breakfast room which option I wanted. We just spent a night at the hostel but everything was perfect. Staff were extremely nice and friendly and helpful. Dinner was excellent Breakfast was good Room was strange - we had a superior room in the abbey which had some original features but also lots of concrete. The layout of the shower was strange so it was difficult to have a shower without getting water everywhere. No working plug in the wash hand basin. Dear sir, Thanks for this email to make me expresse a little my concern and my gratitude meanwhile. Firstly thanks the sir at reception changed the room immidiately and update us to a room larger when I called him saying the room is not non smoking room while I réserve a non smoking room. I was happy with his efficiency. Then when I moved to the privilege room which a few problem: The shower water goes everywhere and you have to hold the head shower to take a shower and after the show the shower room is not accessible. Water everywhere! The door of shower is ruined due to humidity on the ground. It is a big pity for a 4 stars hôtel. Thé room is 318. I recommend you to take a look of that room and update the situation of shower room, install an efficient system for showering. Best regards Xin L.
We love staying here and wouldn't stay anywhere else in Poitiers. We've been enjoying a night's rest and delicious dinner for 3 years now and it's always superb. The staff are so friendly and helpful. The room is always very clean and comfortable. The location is ideal for the town and also secure underground parking within easy reach. The hotel's restaurant is amazing! The meal we had this time was exquisite. I loved its Japanese theme! Toilet was leaking all night and hence keep having water filled and flushed. This was reported in the reception and there were no concern. Even though this was fixed for second night, there were no apologies. Even though I don't use your reward system (use Hotel.com) but do stay most of the time in your chain of hotels around the world. I never expected this from a worldclass chain. I had a nice stay at the Hotel Mercure in Poitiers Center. The room was spacious, bed was comfortable, it was quiet so I slept very well. I had an excellent breakfast with adequate choice of everything from fruit to eggs to jams. Room was clean, shower was enjoyable. We chose this hotel due to its central location and previous good reviews. We were visiting our daughter who is studying in the town. I am also a member of Club Accor. First impressions were good, with the hotel located very near the main town centre. The reception on arrival was both efficient and friendly and the room, whilst a little basic, very clean and comfy. Thereafter, during our stay, we found all staff members to be very friendly and helpful. The building architecture is very interesting too and the restaurant, whilst busy, is of very good quality. Overall, a very enjoyable stay. We drove from Brittany and arrived at 13.45. On checking in we asked the receptionist if we would be able to have a snack for lunch. As we had a car to park it was 14.00 before my husband was back in the hotel and we were told we were too late for lunch. She could have arranged for us to order immediately- or even suggest we ordered room service, but instead we wandered around Poitiers trying to find somewhere to eat as all restaurants had stopped serving. Room 517 at the top of the hotel was disappointing with no character and we were kept awake by rain dripping on the roof. Also didn't like the bathroom with no door, very draughty coming out of the shower. Breakfast area was soulless. We had looked forward to staying in this hotel but the experience was not what we hoped it would be. Very good. Clean rooms, great service by staff. Wifi unclear and unreliable which was a considerable downside. Everything was good- from checkin to checkout. The only thing I’d improve is storage - it’s amost non-existent despite plenty of space. Loved the room and the restaurant. The room, on two levels, was unique. The restaurant was wonderful. Great service as well.